Markets bounce after huge selloff, as investors wait to see what Washington will do next. NEW YORK (CNNMoney.com) -- Stocks rallied Tuesday morning, one day after the failure by Congress to pass a $700 billion financial bailout plan triggered a nearly 778 point loss on the Dow industrials, its biggest one-day point drop ever. The Dow Jones industrial average (INDU) gained more than 200 points in the early going. The Standard & Poor's 500 (SPX) index and the Nasdaq composite (COMP) both gained over 2%. On Monday, the S&P and Nasdaq saw the biggest percentage drop since the 1987 crash. Stocks plunged when investors were thrown by the House decision to reject a bank bailout plan amid the worst financial crisis in years. 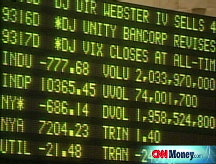 That sharp slide continued in Asian markets Tuesday, although most of the indexes closed off their low of the day. Still Japan's Nikkei lost 483 points, or 4%, while Australia's markets fell 4.3% and Taiwan's stocks retreated 3.6%. Hong Kong's Hang Seng index closed narrowly higher. And Europe's major indexes were mixed in afternoon trading, with Germany's Dax and the Paris CAC 40 both lower while London's FTSE inched higher. However, numerous market analysts agreed the gains in the market Tuesday were likely to be modest. "What we're seeing here today is a little bit of bargain hunting or short covering, at least for the moment," said Peter Cardillo, chief market economist at Avalon Partners. "But this is a very tough situation. Major declines like yesterday generally don't end up reversing the next day." Art Hogan, chief market analyst at Jefferies & Co., said that there is growing hope among traders that enough House members will reconsider their vote to pass it later this week, and that early gains Tuesday are likely a reaction to the perception that the market overreacted to Monday's vote..
"We were taking the rescue plan for granted, and when it didn't pass, there had to be a reaction," said Hogan. But he said that even if the bill does pass later this week, there's enough bad news still out there to keep downward pressure on stocks. For example, economists are forecasting that the Labor Department will report a loss of 105,000 jobs in September in its monthly reading this Friday, which would be the biggest job drop in more than five years. "The market is going to be under pressure when we start to focus on fundamentals and fundamentals aren't going to look good for a while," said Hogan. "The market was down 200 points Monday morning even with the assumption of the passage of the bailout." Congressional leaders are talking about trying to bring the legislation back, although Thursday now appears to be the earliest date for a new vote. David Kelly, chief market strategist at JPMorgan Funds, said that even if leadership announces a new deal, it's unlikely to prompt much of a rally. "It'll be very hard for traders to put their firm's money at risk based on their perception of body language of leadership, given they hadn't properly counted the votes last time around," said Kelly. He said there's enough risk of more bad news, such as another distressed bank sale or bank failure, that could spook markets ahead of the vote. "It's a very, very dangerous market to try to catch a bottom in," said Kelly. And even if the stock markets are starting to show improvement, credit markets do not appear to be ready to improve any time soon, said John Silvia, chief economist at Wachovia. He pointed out that Libor, the rate at which banks lend to each other, climbed once again Tuesday morning to 4.05% up from 3.88% Monday. That's a key measure of banks willingness to lend. "Credit is still just incredibly tight," said Silvia. The credit crisis that prompted the bailout proposal, and attempts to revive the plan, are likely to be the focus of attention for investors once again Tuesday. President Bush addressed the nation at 8:45 a.m. ET, urging Congress to act. The administration was stung when two-thirds of Republicans in the House voted against the bailout package Monday, sending it down to defeat despite the support of 60% of the Democrats who control the chamber. Battered banks: Even if the broader U.S. markets show some improvement Tuesday, bank stocks could be under the greatest pressure again the day after the KBW Bank Index (BKX) fell 21%. While Citigroup (C, Fortune 500) saw shares rebounded 2.2% in heavy Frankfurt trading after losing 12% in U.S. trading Monday, most other major U.S. banks were lower in early overseas trading, with JPMorgan Chase (JPM, Fortune 500) off 5.3%, Bank of America (BAC, Fortune 500) down 8.1% and Wells Fargo (WFC, Fortune 500) off 3.4%. The Wall Street Journal reported that one battered regional bank, Sovereign Bancorp (SOV, Fortune 500), plans to name Paul Perrault as its new chief executive as early as Tuesday. Perrault had been CEO of Chittenden Corp., a New England regional bank that was acquired last year, the paper reports. Other markets: U.S. Treasurys were slightly lower in early trading, taking the yield on the benchmark 10-year note to 3.67% from 3.6%, after a flight to safety sent the yield plunging Monday. Oil prices also rose, reversing the sharp selloff Monday on fears of an economic slowdown, while the dollar was slightly higher against the euro and the yen.